Are you keen for your students to develop good reading skills from an early age? Are you constantly looking for suitable texts to use in the classroom? Do you need materials that are simple to use and quick to prepare? Then you need Primary Reading Box to make your lesson preparation easy. 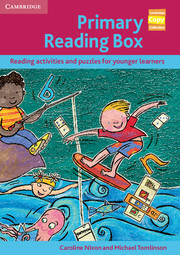 It contains over 50 photocopiable reading activities designed especially for the primary classroom. * Material for children at all levels. * Clear step-by-step teaching notes make the activities easy to use. * Students are exposed to a range of different text types including fiction, magazines, comics, short stories, poems, jokes and recipes. * A wide range of activity types ensure pupils are given the opportunity to work in pairs, small groups and the whole class to develop reading confidence. * Many of the activities are suitable for learners preparing for the Cambridge Young Learners English Tests (Cambridge ESOL).